Have you finalized your preparations for the Swingset Skirt sew-along yet? Join along with your friends starting Monday. So far we have heard from five panelists: Brienne, Katy, Meredith, Rachel, and Sally. 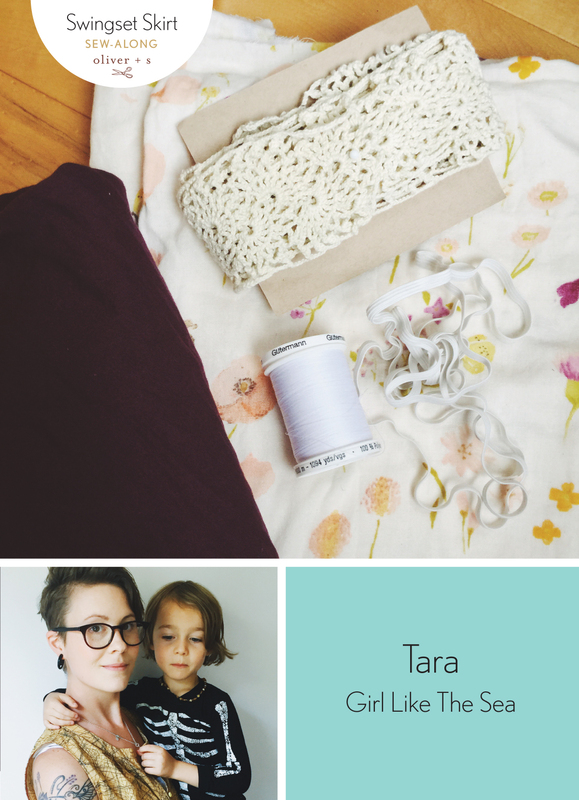 We have now come to our sixth and final panelist, Tara. Her amazing Swingset Tunic (lengthened to a dress) was featured here on the blog last year. What has she been plotting for her skirt? Have a look and see. Hi, I’m Tara, and I blog every so often at Girl Like The Sea. Mostly about my creations, a little about homeschool, a little about mom life. My three crazy little minions (age 6, 5, and 2 with another due in April) take up most of my time, as I not only stay at home full time, but homeschool as well. I’ve got a princess, a wild thing girl, and a Prince Charming who all make sewing for them fun and interesting! I’m a crunchy, geeky, eclectic, foody, moody kind of person who’s always got a pile of works in progress, books in progress, a half consumed cup of tea or coffee, and cleaning projects half done. Fabric: Nani Iro floral double gauze and an organic purple cotton sheet for the lining. I’ve been hoarding this Nani Iro for ages and am finally willing to admit that it’s time to give up the dream that I was going to make myself something with it. Lol. Size: Size 7 length, with drastically cinched elastic for my 3T width beanpole 6 year old. Modifications: I’m not sure yet. Maybe nothing! Maybe I’ll add the lace trim I have in my stash. I love this pattern as it is, and have made it several times before. Normally I feel the need to personalize a pattern, but this one just works for me. That being said, I’m not married to the idea I’m starting with. If something sparkly and gold crosses my path, I might have to add it in…. Sewing notes: Maybe this time I won’t be lame and skip making the drawstring….heh. Since everyone is paying attention now. Plans for styling it: Oh, that’s a good question. I just made my daughter a really cute sweatshirt with a ballerina graphic on it, which could look really cute. Or I might decide at the last minute that I need to make her a tee to go with the skirt. The photos will most likely be photobombed by her younger siblings. This might be a good reason to finally get her a new pair of shoes that aren’t rubber boots or hot pink Nike sneaks. So there you have it. Now you’ve seen the plans from all of our panelists. Weren’t they spectacular? Wasn’t it nice to hear from the creative people you admire? We know how much you love seeing the fabric other people select for sewing up different Oliver + S patterns. And how about you, what are your plans for your Swingset Skirt? Grab your materials, get your pattern (paper or digital), and get ready to sew because the sew-along starts Monday. Have you already finished a Swingset Skirt? Add your link here to show everyone what you’ve done with the pattern and to be entered in the contest for a great prize!